Opera Max has been out for a while, and it's been helpful to those who find themselves running low on data each billing cycle. This app uses Opera's servers to compress web content and save bandwidth, but it can only do so much. The big consumer of data is video served over https, and Opera Max couldn't do anything about that until now. The latest version, however, adds support for automatic YouTube and Netflix compression. There's more than the video features in the new version, so here's the change log. In the settings of Opera Max, you can change the level of compression for images and videos independently. You can also disable either of them if you like. According to Opera, the Max servers can crunch down 10MB of video to just 3MB. It also reduces buffering on weak connections. Your video probably won't look super-awesome compressed like that, but it's more convenient than manually changing quality settings in YouTube. Netflix doesn't have quality settings in the app at all. Support for more https video services will come in the future too. 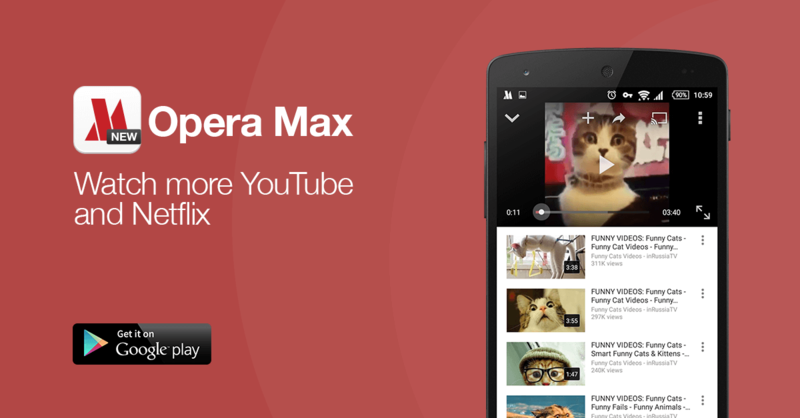 Opera Max is free, so give it a shot. We've got it on APK Mirror as well.